This work is a valuable addition to understanding issues of the press and censorship in France. Rodmell's introduction emphasizes publication problems faced by writers in eighteenth- century France. This edition includes Malesherbes's first and second Memoire, to which Rodmell adds seventeen pages of notes. In his Memoire, Malesherbes suggests changes to the book trade and condemns censorship's arbitrary nature. 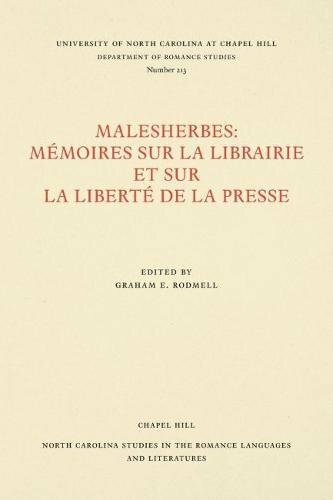 Rodmell's introductory analysis proposes that Malesherbes wanted to make censorship a tool for liberalism. If you have any questions about this product by Brand: U.N.C., Dept. of Romance Languages : [distributed by University of North Carolina Press], contact us by completing and submitting the form below. If you are looking for a specif part number, please include it with your message.